In English, we use the Present Perfect (e.g. I have been) to express an action started in the past but that is still going on in the present. I have lived here for four years. Je suis avec ma copine depuis 2005. I have been with my girlfriend since 2005. J'habite à Paris depuis quatre ans. I have lived in Paris for 4 years. Je parle depuis 45 minutes. I've been speaking for 45 minutes. Notice that in French, to express the same kind of actions, we use depuis with Présent indicatif. 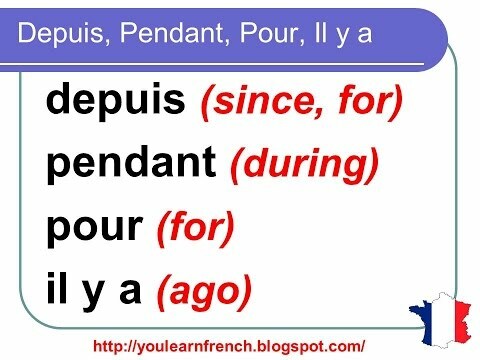 Depuis can mean both for + [duration] and since + [date] in this context. Note that you can never use pour in that context. De quelles question et réponse parlez-vous ? This lesson was referenced for the writing exercise "Cathy's vacation". Although the first sentence here in English expresses the idea of doing something for a while, ALL of the FRENCH examples use "depuis". It would be really helpful to have other instances used as examples of the "present perfect" - especially when we are bounced back to this lesson in the midst of an exercise that is not about “depuis”! linked question with passé composé correct? “Les Souillard sont mariés depuis plus de vingt ans." means: The Souillards have been married for more than twenty yearshi there, I had tenabove q&a linked to this lesson, but is it a correct match? the lesson is about not using passé composé and this correct answer uses it (i think). any help would be appreciated as I don’t see the specific example in the lesson or anything matching it’s form, thanks! This might look like a passé composé on first inspection but it actually is present tense passive voice. Can I use these words interchangeably? Take a look at the following lesson on how to use 'il y a' meaning 'ago'. Je vis en France depuis 10 ans. -- I've been living in France for 10 years. J'ai vécu en France il y a 10 ans. -- I lived in France 10 years ago. Apologies if this is in wrong section. I am fairly certain that I can use: Depuis mon amie Paul vit en ma maison en Glasgow, je reste à Lyon avec ses parents. Can I reverse the order of the clauses. Depuis je reste à Lyon avec ses parents, mon ami vit en mon appartement en Glasgow. Puisque je reste à Lyon avec ses parents, mon ami vit dans mon appartement à Glasgow. Yes, there is no reason why you cannot start the sentence with puisque. I apologise if I have misunderstood the meaning of your question. Thanks very much. I misunderstood the meaning of "depuis". Either the beginning or the end is ok. Not much different from English. J'ai étudié le français pendant deux ans. I don't think there is a rule forbidding the use of imparfait in conjunction with pendant. It's just that in this example, I would use the passé composé. The opinion of a native speaker would be greatly appreciated, though. Can we use l'imparfait with pendant? Why is this reflexive verb conjugated in passé composé ? The quiz question about translating "When I was young, people dressed differently" is answered as: "Quand j'étais jeune, les gens s'habillaient différemment." "Quand j'étais jeune, les gens se sont habillés différemment"? s'habillaient is the imperfect, se sont habillés would be passé composé. You can only use the imperfect ( imparfait) here as it describes something people did (used to do) in the past. It is not a question of agreement, as the s'habillaient is in the third person plural (they) it is just the tense that is wrong. Thank you, Cécile and Chris. I understand now. It really comes down to the idea that l'imparfait should be used when describing an ongoing action in the past. I was under the impression that l'imparfait was only required for the first part of the answer ("j'etais"), while the passé composé could be used for the second part. It's clear now. Thank you so much.